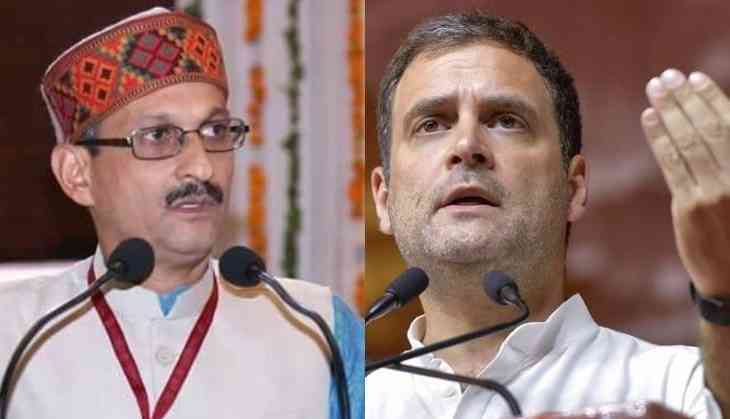 Himachal Pradesh BJP chief Satpal Singh Satti made an obscene comment against Congress president Rahul Gandhi over his ‘Chowkidar Chor Hai’ remark while campaigning for Lok Sabha polls. Speaking at Public rally in Baddi town of Shimla Lok Sabha constituency, Satti said that if Rahul Gandhi calls Prime Minister Narendra Modi-- who calls himself ‘chowkidar’ of the country-- a thief than he is also free to abuse him. "Rahul Gandhi is out on bail, his mother is out on bail, his brother-in-law is out on bail, and yet he calls the Prime Minister a thief. A Punjabi man asked me to convey this to you with a heavy heart, and that inspires me to tell you this. If PM Modi is a thief, then you are a m********," Satti said in the rally. The video of his speech has been viral on social media. Meanwhile, responding to his Satti’s slur, Congress spokesperson for the state, Naresh Chauhan said party consulting its legal cell and may soon file a complaint. "We are taking the opinion of our legal cell. Subsequently, we may file a formal complaint against him with the Election Commission," Chauhan said. This drew Congress spokesperson Priyanka Chaturvedi attention who took Twitter to take a jibe at Union Minister Sushma Swaraj over seeking response of SP founder Mulayam Singh over Azam Khan by sharing a video of Satti. “Just hear the sanskaari Bhajapai. Hello Sushma Swaraj ji, I look forward to your condemnation and you asking your party to seek suitable action. PS: Don’t let them act like Dhritarashtra or Gandhari in this case,” Chaturvedi tweeted. SP leader Azam Khan has been hugely criticized over his ‘Khaki underwear’ remark against Jaya Prada on Sunday. An FIR has also been filed against him.